A signature by mark is being notarized is required when a signer cannot sign their full legal, normal signature. This most often occurs when a signer is disabled, has an injury on their hand, arm, or fingers, which prevents them from signing normally. Sometimes signers must utilize alternative means of signing, such as holding the pen in their mouth. Whichever case it may be, it is possible to notarize when using a mark signature. 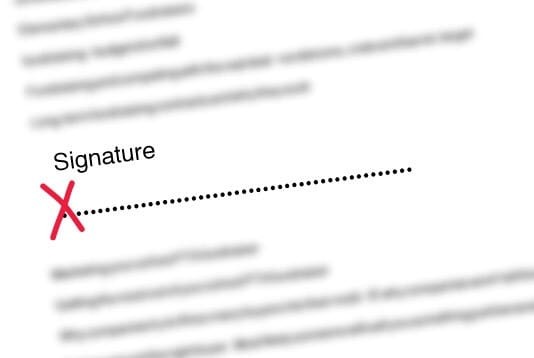 There are a few requirements for signature by mark, and for getting notarized when signing this way. There must be two witnesses who must watch the signer sign. The witnesses must also sign the document as witness to the mark. One witness must print the signers name next to the mark. The signer must also mark the Notary Public journal. When the mark is made in the Notary Public journal, one witness must write the name of the signer, and sign their name as witness. Signature by mark can be a complex process, and signers should always consult a lawyer in regards to the legality of a signature by mark for the intended purpose of the document. Even though California Notary Publics are allowed to notarize a signature by mark, this does not mean that the signature is sufficient for the recording agency, or the party to which the document is going to be presented to. When a signer is unable to sign their name as usual, and as it appears on their driver license or other form of identity, they can utilize signature by mark. This mark can be a line, x, or other shape typically. Sometimes it is the first initial of a name. It just must be the same mark used throughout documents, and in the Notary journal in order for the Notary Public to notarize that signature.